North Korea may be trying to restart a nuclear reactor which can produce fuel for a nuclear bomb, an American think tank has said. The US-Korea Institute said on its 38 North website that satellite images showed steam coming from the Yongbyon plant and an increase in melted snow. But the observers said there was not enough information to reach a "definitive conclusion". Yongbyon's reactor was shut down in 2007 but was restarted in 2013. Meanwhile, a top US official visiting South Korea emphasised on Thursday that the denuclearisation of North Korea was their "first priority". The US-Korea Institute, based at Johns Hopkins University in Washington, said the satellite images taken between 24 December and 11 January showed new activity at Yongbyon. These may indicate the North Koreans are "attempting to restart the plutonium production reactor", which has been lying dormant for almost five months. 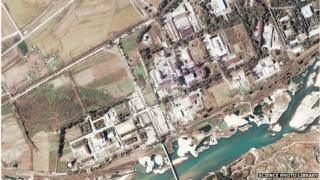 North Korea's main nuclear facility, believed to have manufactured material for previous nuclear tests. Reactor shut down in July 2007 as part of a disarmament-for-aid deal. International inspectors banned in April 2009 when North Korea pulled out of disarmament talks. Reactor restarted in 2013, the same year North Korea conducted a nuclear test. Became dormant in August 2014. Nuclear test based on uranium device would be harder to monitor than plutonium. Steam and melted snow could be a sign it was generating heat, said the report, and advised further monitoring of the site to see whether it was likely to be a cause for concern. "It remains too soon to reach a definitive conclusion on this and also on whether that effort is moving forward or encountering problems," the report said. Activity at the reactor was last detected in November. That same month, North Korea threatened to launch a fourth nuclear test in response to a United Nations move to probe the country's human rights violations. But South Korea's defence ministry said there was "no circumstantial report that North Korea is making final preparations for a test". The US Under Secretary of State for Political Affairs Wendy Sherman, who is on a two-day visit to Seoul to discuss various bilateral issues, said the denuclearisation of North Korea remained the first priority on the peninsula for the US. "We look forward to ending the division and for the Korean people to be in a unified country under democratic rule without any nuclear weapons, without any threat to the territory," she said. In 2008, North Korea walked away from six-party talks with South Korea, the US, China, Japan and Russia on its denuclearisation. The other countries have since tried to persuade North Korea to return to the negotiating table. Earlier this month North Korea offered to stop nuclear tests if the US stopped holding military drills with Seoul, but the offer was rejected.